When most collectors think of revenue stamps they think of taxes being paid. In this column we examine some stamps that paid no taxes to the government. The bulk of these stamps are not found in the Scott U. S. Specialized, but at least some of them are closely related to stamps that are listed. Let’s begin with Brewer’s Permits, stamps that were issued to allow untaxed beer to be transported from the brewery to a bonded warehouse, often in a city quite removed from the brewery. Once the kegs of beer left the bonded warehouse for sale to a drinking establishment the taxes had to be paid and evidenced with one of the Scott-listed beer stamps applied to the keg. 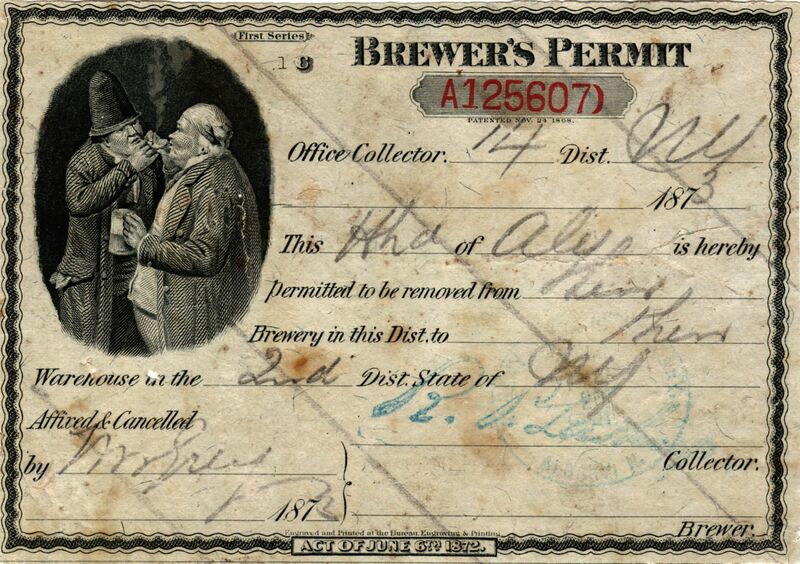 The Brewer’s Permits were first issued in 1872 and various issues were in service until about 1918 and the rapidly approaching years of National Prohibition. The 1872 Brewer’s Permits of the so-called First Series features a charming vignette entitled “The Smokers.” The man on the right is holding a stein of beer in his left hand. They were printed by the Bureau of Engraving and Printing on the same gray Wilcox’s Çhameleon paper that was used for many contemporary revenue stamps, including the familiar second and third issue documentary stamps (Scott R103 - R150) and the general proprietary stamps (Scott RB1a - RB10a). Many unused examples of this stamp exvarious issues were in service until about 1918 and the rapidly approaching years of National Prohibition. Later, the government permitted brewers to export their beer free from tax. Prior to 1891 the brewer would have had to pay the tax and after the beer had been shipped apply for a drawback on the taxes paid. Not only did this tie up the brewer’s capital, but it required an elaborate record keeping on the part of the government as well as officials to process the papers to return the taxes to the brewer. The 1891 Export Stamp for Fermented Liquor (Figure two) features the allegorical female figure in the foreground of a harbor scene with a large sailing ship in the background. Coupons at the left were trimmed to accommodate different size containers. 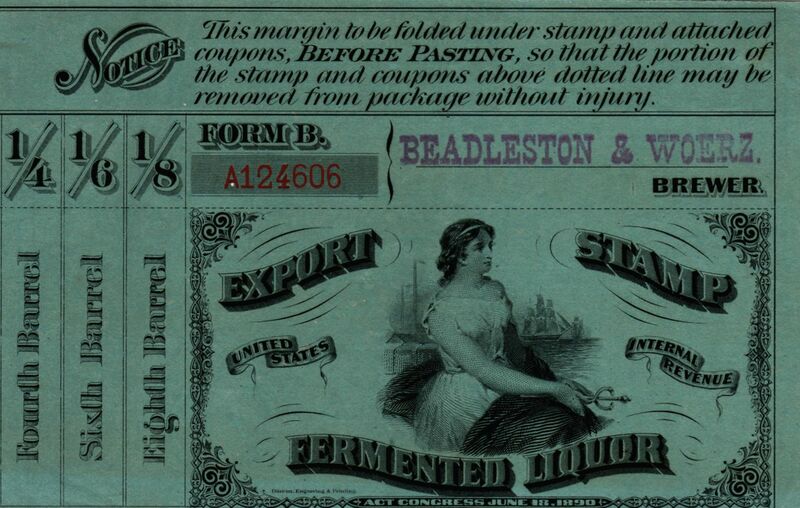 The generic stamp illustrated was trimmed for placement on a fourth barrel of beer. Less than twenty of the 1891 Export stamps are believed to have survived in collections today. The late Sherwood Springer included both of these categories of stamps in his 10 editions of catalogs that were only late twentieth century reliable listings of the so-called taxpaids. Ironically neither of these categories showed any evidence of a tax paid! While some tax exempt stamps are listed in the Scott U. S. Specialized Catalogue, the absence of the above two categories of stamps in the beer listings is somewhat of a mystery. Indeed, these stamps were required for use on kegs of beer under the circumstances described above. Perhaps the editors will soon see the wisdom for the inclusion of these stamps in their listings. Most people today fail to realize that oleomargarine has been marketed in the United States since the 1870’s. Dairy interests and the Progressives who were concerned about consumer protection from fraud combined to convince Congress that oleomargarine should be taxed. In 1886 a two cent per pound tax was enacted. The stamps that were issued were to be applied to the wooden firkins of oleomargarine. The public’s skepticism of manufactured foods was reflected in the legal definition of oleomargarine. It must contain the same percentage of fat as found in butter. To the twentieth century shopper this seems strange and out of step. Today we try to avoid excessive fats in our food! To the best of my knowledge this definition is still in force, which probably accounts for the absence of a product called oleomargarine in the dairy cases of most stores today. I distinctly recall in the 1970’s finding something labeled imitation oleomargarine on the shelves of our supermarkets. This must have been among the first attempts to market a product that did not meet the fat requirement needed to call it oleomargarine. Various table spreads and even something that boasts that the consumer won’t believe it’s not butter now fill the dairy cases in our supermarkets. For the same reason as explained with fermented liquor, the law provided for the export of oleomargarine free from payment of the domestic tax. Export stamps were issued so that the inspectors from Internal Revenue could quickly identify that the firkins intended for export were accounted for. 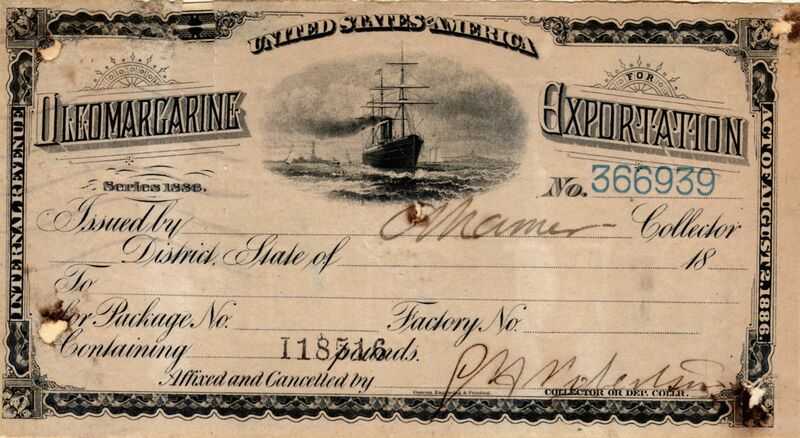 The Export Oleomargarine stamp features a large combination sail and steamship, typical of freighters that were used in the export trade. 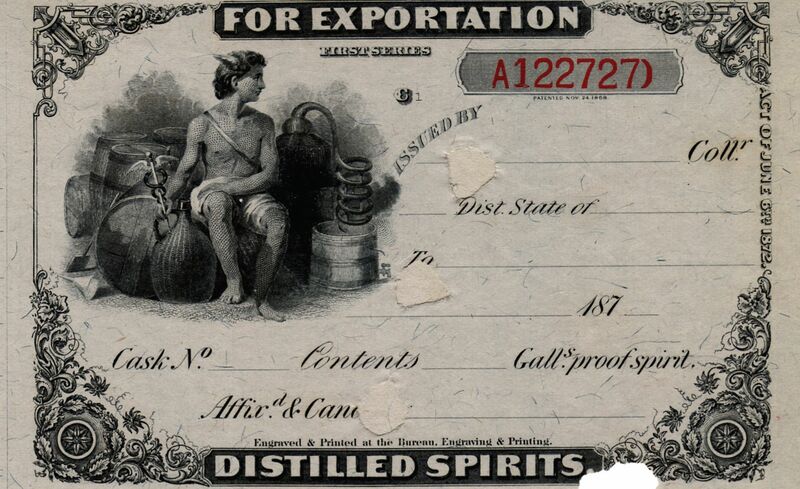 Distilled spirits is another category of manufactured product for which the government provided export stamps to designate that the internal revenue tax had not been paid. The first of these stamps was issued in 1872 and like the 1872 Brewer’s Permit examined earlier, it has the designation First Series as part of the design. Once again it has been printed on Wilcox’s Chameleon paper by the Bureau of Engraving and Printing. All the examples I have ever seen are Deats and Sterling remainders with pie wedge shaped cutouts. The vignette is the allegorical Mercury with a still and worm used in distilling to the right and various barrels and containers for the finished product to the left. There are other categories of manufactured products which were taxed for which an export stamp was issued which exempted the product from tax. Bottled distilled spirits, cigars, and tobacco come immediately to mind. We’ll cover those later.